The MB-D18 Multi Battery Power Pack can be powered either by six AA batteries (Alkaline or Ni-MH or Lithium), EN-EL15(a) or EN-EL18a/b rechargeable Li-ion batteries. To use the MB-D18 with AA batteries, use the supplied MS-D12 AA Battery Holder. 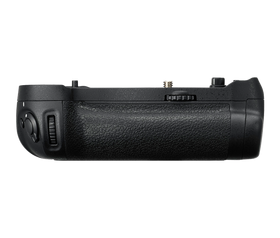 When using the optional BL-5 battery chamber cover connected to the EN-EL18b/EN-EL18a, and inserted into a MB-D18 Multi Battery Power Pack, you may achieve up to 9 fps continuous shooting with the D850. When using an EN-EL18b battery to power the MB-D18, use the optional BL-5 battery chamber cover (sold separately). Up to 9 fps. Based on CIPA Standards. With the EN-EL15a Rechargeable Li-ion Battery in the body and the EN-EL18b/EN-EL18a in the MB-D18. Optional BL-5 Battery Chamber Cover and MH-26a/MH-26 Battery Charger required for use with the EN-EL18b/EN-EL18a.